Confession time…When I was little, say 10 years old, my neighborhood friends and I would grab a pair of scissors to wander our neighborhood and steal prune flowers here and there from the beautiful gardens to give to our moms. We always told our moms that we cut the flowers the flowers from our friends’ yards, and our moms thought we were such generous and thoughtful children. While I certainly don’t condone stealing your neighbors’ flowers, this little foray into the ‘dark side’ started a love of floral arrangements and flower gardens, and I am especially fond those that have that have that loose, gathered from the garden, inspired by Dutch master painters feel. 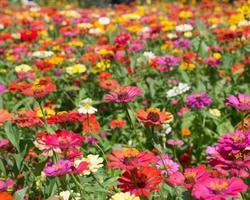 A reader asked me recently what are the best flowers to grow in a cutting garden. There are dozens of flowers that work well in floral arrangements – I mean you could dedicate your whole garden to roses! I thought I would help you out here and give you a list of 10 of my favorite flowers that are fairly easy to grow and look beautiful both in the garden as well as in the vase. 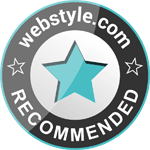 Choose flowers that have stiffer stems, have long lasting blooms, and are fairly fast growing. Amend your soil with an organic fertilizer that has adequate phosphorus (the middle number on the fertilizer package), which is necessary for healthy flower production. I like G&B’s Bud & Bloom fertilizer. 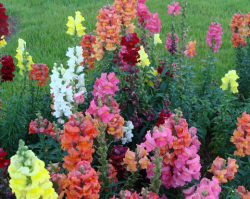 Southern California nurseries are full of snap dragons in the late fall and winter (spring in colder climates) and come in many colors. They are long lasting in the garden as well as in the vase. 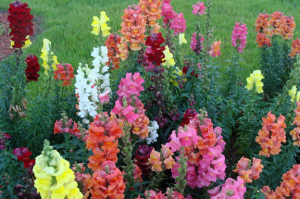 Snap dragons come in many colors. Asters are star shaped daisy like flowers from the family Asteraceae (daisies are part of this family too). These flowers that most often come in shades of purple, pink, and blue are very prolific and can grow to 8′ tall x 8′ wide. Mums are a perfect long lasting flower for a late season cutting garden. They are the birth flower for November. They are also related to Asters. Depending on the variety, mums are shaped like daises, buttons, and even pom poms. 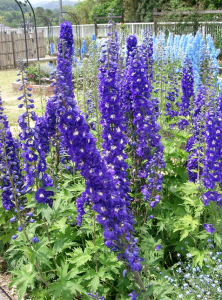 Delphiniums are essential in an English cottage garden. 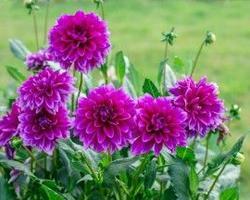 assortment of Dahlias from tiny button-shaped flowers to flower heads the size of dinner plates. Dahlias are a must for any cutting garden. 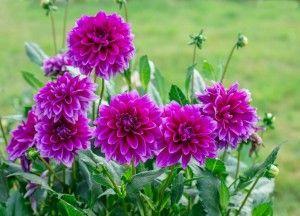 Dahlias are native to Mexico and also a member of the Asteraceae family. 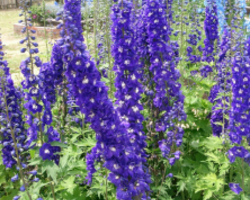 Even though you can find Delphiniums in white and pink, the blue shades are my favorite. These tall (up to 6′) flowers are a perfect focal point for cottage or English style gardens, and they especially enjoy areas where it is cool and moist. Lisianthus’ multi-petaled flowers often resemble a soft rose without thorns, and they look great with roses in an arrangement. I had white and blue Lisianthus in my centerpieces at my wedding. I love them because they are long lasting in the vase, often staying fresh looking for 2-3 weeks. These lacy white umbrella shaped flowers (related to carrots!) are my favorite ‘filler’ flower in the vase. They are easy on the eye and not as common as baby’s breath. 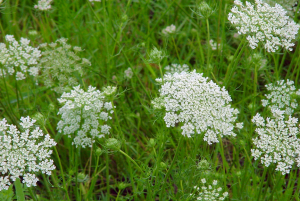 Although it is considered invasive in some parts of the country, Queen Anne’s Lace also looks lovely in the garden and attracts beneficial insects. 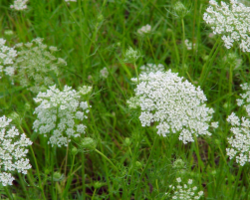 Try Queen Anne’s Lace in the vase as filler flowers. 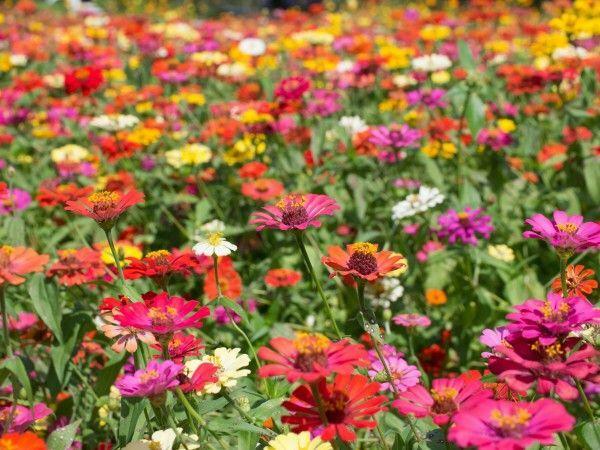 Zinnias are related to sunflowers (which also make great cutting flowers). With their hot colors, they are a living advertisement for summer and do a great job in attracting bees and butterflies. What are your favorite flowers for creating your own floral arrangements? 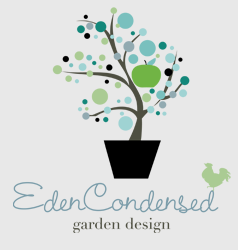 Would you like to know more about how to grow and take care of a cutting garden? Let me know in the comments below.